Handgun hunting has put the fun and the challenge back into opening day for me. Once you grow accustomed to not lugging a rifle around in the field, you feel a certain liberation and have trouble going back as a result. You can pack more than enough terminal punch in a three-pound bundle strapped to your belt, leaving your hands free for other activities. I’m not really a member of the trick-of-the-month club, but I do take all new products (including calibers) into careful consideration. There has been a bit of a boon in handgun hunting products over the last dozen years or so, but I keep going back to an old standby. While there are many caliber options available to the prospective big game handgun hunter, I think we can all agree that the minimum is the .357 Magnum. I think the .357 Magnum is a fine cartridge – within certain limitations of use. One must carefully pick their shots, particularly if loaded with mid-weight hollow-points probably better suited to personal defense. There is a common misconception about caliber magically making up for shot placement. But, poor shot placement won’t bring you closer to success irrespective of the diameter of your bullet. 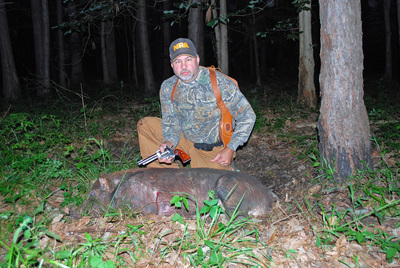 The core of handgun hunting – actually all hunting, is shot placement. If you do your part with a properly loaded .357 Magnum, you will undoubtedly fill your freezer with venison. I harbor no ill will towards the first cartridge to bear the moniker Magnum, but, I’m a worst case scenario kind of guy. I don’t know if it is a side effect of being a Marine, but I have always planned and prepared for the waste hitting the fan. A large part of that mental state is the game of “what if.” “What if” the trophy buck of a lifetime presents himself to this lucky hunter and the only shot available is the southern end of the northbound animal? “What if” I encounter a big ole nasty boar, equipped with big teeth and a two-inch gristle plate? “What if” a bear decides that I will make a splendid meal (hey, don’t laugh, I wasn’t half bad in my younger days)? Well, in the game of what if, I like to err on the side of the worst case scenario. Granted, I have hunted with handguns from the diminutive .357 Magnum all the way up to .500 Maximum, but I am not suggesting that one needs a half-inch diameter bullet to get the job done – or the debilitating recoil that comes with the truly big calibers. That said, I am not a bare minimum kind of a guy either. There is a price you pay when demanding usable power in a 3-lb firearm and that is recoil. There is simply no way around it, but it doesn’t have to be so heavy that the shooter fears touching it off. But, I like having the option of taking raking shots on game, knowing my bullet will traverse the length of the whole animal and still reach and most importantly destroy the vitals, leaving a large wound channel in its wake. That’s why I like the .45 Colt so much – not the .45 Colt of your great, great grandfather, but the modern iteration. 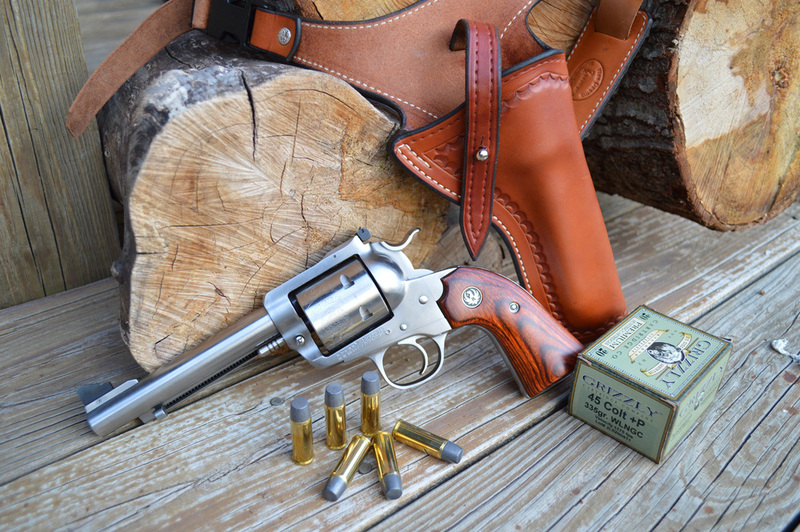 Granted the .45 Colt even in its Wild West black powder form was no slouch. Loaded to potential – and I am not talking about .454 Casull levels, the .45 Colt will not leave you wanting or needing more. Not someone who abides by muzzle energy as a means to predict terminal effectiveness, I rely upon bullet weight, nose shape, and a clear understanding of the anatomy of the game I am hunting. Why is this important? Because these revolvers penetrate all out of proportion to what their paper ballistics suggest, and it is not hard to reach the vitals even from the back end of a large animal. The .45 Colt’s diameter is large enough to guarantee a large wound channel by default. When your bullet starts out at nearly a half-inch in diameter, there is really no good reason to require expansion. And, at 30,000 psi, the new-age .45 Colt will sling a 335 grain hardcast bullet over 1,300 fps. That is formidable power without the excessive noise and pressure of its little cousin the .357 Magnum. Even the standard bearer, the .44 Magnum, cannot reach these performance levels without significantly higher pressure. These are considered Ruger-only loads (to include BFRs and Freedom Arms revolvers) that are not safe in Colt Single Action Army revolvers or the various facsimiles produced by a number of companies. This level is still 35,000 psi shy of the much-vaunted .454 Casull. While recoil at these levels is sizeable, anyone who can handle a .44 Magnum can easily master the turbocharged .45 Colt. When not rolling my own, my factory load of choice is Grizzly Cartridge’s excellent 335 grain WLN load that has printed two-inch groups for me off of the bench at 50 yards. Can’t argue with that level of accuracy for a “one-size-fits all” factory load. But, this load is most impressive from a terminal standpoint. The wide flat-nosed bullet penetrates deeply and creates an impressive wound channel, and nearly always exits. I like two holes in my game animals. 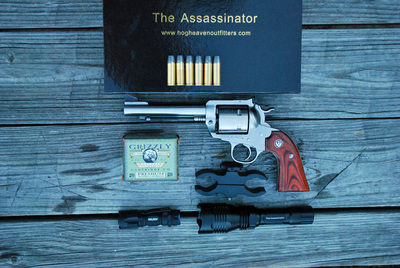 My go-to hunting revolver in .45 Colt is a Ruger Bisley with a 5 ½-inch barrel. This is a Distributor Exclusive made by Ruger for Williams Shooters Supply. The sight radius is long enough for me to shoot accurately with open iron sights, and the Bisley grip frame does an excellent job in controlling the stout recoil when touched off. A good revolver deserves good leather and here I haven’t skimped either. I carry my Bisley in a 7x Leather (www.7xleather.com) chest rig, designed to be comfortably worn even if you have a pack strapped to your back. 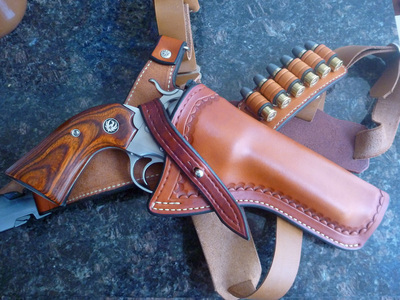 This revolver weighs in at a paltry 46-oz empty, and when riding in a holster, I often forget it is there.